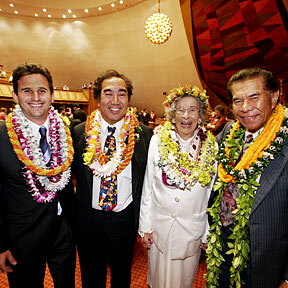 PAU HANA CREW: Yesterday's final day of the 2006 Legislature meant farewell for House members Brian Schatz, left, Dennis Arakaki, Helene Hale and Ezra Kanoho. Also bidding goodbye were Rep. Bud Stonebraker and Sens. Bob Hogue and Brian Kanno. Tax cuts and higher cigarette prices are due as the Legislature closes to mixed reviews. Family members of the victims express relief at the arrest. Multiple Grammys prove John Legend worthy of his last name. The 16-year-old from Honolulu makes the cut in a men's event in South Korea. Local investor Brian Anderson is selling the property near Diamond Head, which will get a new name. The Legislature has enacted a bill that raises the standard deduction for income taxes and adjusts the tax brackets.